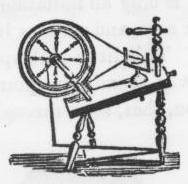 Great household image for crafters of a spinning wheel. Images in this group are copyright free and in the public domain. This black and white spinning wheel image would make a great addition to your next creative project.